Editor note: In order not to overwhelm readers with posts during Pubcon, we’ve saved a few additional sessions for posting this week. Enjoy! Content is king. In spite of all that has changed in the online sphere since its inception, content is still the critical element to a compelling website. Providing relevant, fresh content on a regular basis can increase site traffic and improve search engine rankings, which in turn increases ROI. Yet delivering well-structured content of interest to your audience can be difficult. In Real-World Winning Tactics for Content Creation, three content experts gave their tips and advice for effective content creation, from blogs to mobile websites. Moderator Derrick Wheeler introduced the concept of content as “anything a user can see, and anything a search engine can see.” Ted Ulle, partner with the MEWS Group, Robin Liss, Founder and President of Camcorderinfo.com, and Rupali Shah, Organic Search Manager of GroupM, each spoke to creating specific types of content successfully for your website. Ted Ulle began the session with a lesson in how not to create a ‘Frankensite,’ or a website whose content and structure is a hodge-podge of mismatched elements that don’t work together. His broad definition of content included not only the text on a site, but also the structure and format of the site itself. Locate and educate everyone involved in the content creation workflow: IT Department, web design, writers, analytics, research & development, etc. Above all else, content creators need to keep the business goal in mind at every stage of the process. All aspects of content creation and site design should support the bottom line. In terms of actually creating the content, Ted cautioned against drafting copy around what he referred to as “trophy keywords,” or terms you think your site should be found for instead of the terms your audience is actually searching on. A solid base of relevant keywords is the first step in successful content creation. The structure and form of a site tie directly to the effectiveness of content. Ted advised using the content as a guide for structure by dividing it into logical groupings that will inform the site menu. A solid site layout will support good copy, so site designers should be familiar with elements such as typography that can enhance usability and reinforce the tone of the site content. Formulating a strategy and creating a complimentary structure for site content are important elements, but the meat of content creation lies between the two: drafting copy. Robin Liss has extensive experience in this department, having been writing for content-rich websites since the age of thirteen. Robin likened the content creation process to Ford’s assembly line. Content producers should approach writing copy like manufacturers approach creating a product. Whether writing for a personal blog or coordinating the efforts of several professional writers and editors, a similar assembly line mentality can help content creators produce successful copy. Content Production Push the content live – this step can have its own assembly line if necessary, and encompasses loading the copy, optimization, marketing and revision and updates. An assembly line approach allows content creators to efficiently write the fresh, relevant copy that can ensure high site traffic and high rankings. Isolating each step of the process allows content creators to identify any bottlenecks and address issues to ensure the entire content creation process is streamlined. Liss recommended assessing a company’s content needs and adjusting the assembly line accordingly. In some cases, a company may want to hire professional writers skilled in their area of expertise to write copy. If this is the case, you get what you pay for, Liss cautions. There is no substitute for high quality copy so prepare to compensate accordingly. Good site content is important no matter where searchers view a website. Yet what constitutes good content can vary. 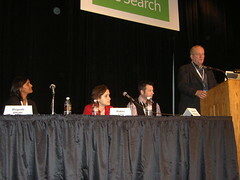 Rupali Shah took the session in a different direction by examining the content demands of mobile search. As of January, 84 percent of iPhone users reported accessing news and information via a web browser on their phones. Those with access to smart phones are using them to search the web, and as this number continues to rise so will the number of searchers who view a given website on a mobile device. Different elements should be taken into consideration when creating mobile site content versus creating traditional web content. Rupali outlined several important factors to keep in mind. Those getting started on creating a mobile site can use several free web tools for assistance. Overall, mobile Internet users are searching for information they need on the go fast. This dictates content creation for mobile sites and should be taken into consideration before embarking on mobile site creation. Some products and services are better suited for current mobile Internet use while others may not yet have a market on the mobile web. The three presenters in this PubCon session illustrate an important point. Content on a website extends beyond text and encompasses layout, structure, images, and more. Effective content creators must ensure all of these elements are compelling and relevant in order to attract site visitors, increase search engine rankings and improve online business performance overall. Check out all of TopRank’s blog coverage of the 2008 Pubcon conference here and view our Pubcon photos on Flickr. Great summary of the session! If you have any feedback for next time, let me know.